PLEASE NOTE: This review is out of date and does not reflect significant improvements made to the product since its introduction. AN UPDATED REVIEW OF THE BENQ HT2550 CAN BE FOUND HERE. The BenQ HT2550 is one of several new 4K projectors to hit the market in the last few months that is built around the latest 0.47" UHD DLP chipset and selling for under $1500. Unlike some of the other 4K projectors under $2,000, the HT2550 is 3D capable, although it needs to be put into a native 1080p mode for 3D display. But for those who have a collection of 3D discs in 1080p HD resolution, this is a welcome feature. Beyond 3D, the HT2550 has a few other handy features. It weighs under 10 lbs, so it is portable enough for backyard movie night or other transportable uses. It has a remarkably robust onboard speaker with impressive dynamic range that is surprising for its size--again a nice feature for temporary backyard use. And it has keystone adjustment, a feature that is missing on several of its competitors. At the current price of $1499 the BenQ HT2550 competes directly with the Optoma UHD50 and the Vivitek HK2288 (both also at $1499), and the ViewSonic PX727-4K at $1299. Brightness. The BenQ HT2550 is rated at 2200 lumens. As is typical, this projector has an exceptionally bright factory calibration, called "Bright," that is decidedly green in tint and for the most part useless for video presentation unless you don't mind a green picture. It also has presets labelled Vivid, Cinema, Sport, and two custom adjustable User modes. The HT2550 has a Brilliant Color function, but unlike most implementations that can be adjusted on a scale of 1 to 10, this one is a simple On or Off. Turning it off reduces lumen output by about 20%. In Vivid and Cinema modes, with Brilliant Color set to On, color brightness measured about 81% of white. When Brilliant Color is turned off, color brightness matches virtually 100% of white. There is no noticeable loss of color saturation when Brilliant Color is on but large white elements in the scene can appear a bit overdriven. There is also an Economic lamp mode which reduces lumen output by 36%. If you activate both Economic and turn Brilliant Color off, overall brightness is cut by 49%. So there are a few options for setting brightness to where it is optimum for your particular set up. Zoom lens light loss. The HT2550 has a 1.2x zoom lens that loses virtually no light at all if set to its longest throw position. Technically, we measured a loss of 1.5%, so there is no reason to worry about which end of the zoom you're using. SDR Picture Quality. The HT2550's SDR picture in Cinema mode is biased toward a cool blue, but not so much that it looks like you are viewing through a blue filter. The shift toward blue increases the rich blue in skies and makes clouds, white lettering, and other white objects look a crisp brilliant white. Many people like this effect, which is not unlike the blue color bias of Fujichrome compared to Kodachrome slide films back in the day. And since the brain's perception of color is infinitely forgiving of modest color inaccuracies, the picture can look perfectly well balanced and normal. Nevertheless, some calibration is required to dial in a warmer image in order to get optimal natural flesh tones. When that calibration is done, the picture looks (in our opinion) substantially better than it does out of the box. Contrast is quite acceptably good, and the projector can deliver a thoroughly enjoyable image without any sense of less than sufficient contrast. In most cases it is not quite up to the competition but the differences, by and large, are not drastic. At 10,000:1 the HT2550 carries the lowest of the contrast ratings among the 4K projectors in this price range, and this is not unrealistic. HDR Picture Quality. The first thing one notices with HDR subject matter is a color balance shift toward cool, similar to that in SDR. Flesh tones are weak and lackluster. So again some methodical color calibration is called for to get it tuned up to optimal performance. Other than the color issue, the HDR picture is visibly higher in contrast than SDRs as one would expect. No projector will or should be expected to deliver the extreme HDR contrast of flat panels, which is a good thing--front projection avoids the artificially overprocessed look that is common on flat panels. What you get on the HT2550 (after color adjustments) is an attractive high contrast HDR image that looks naturally balanced and not overprocessed. The HT2550 has brightness options for HDR in the menu. The default setting is 0, and you can change it to +1, +2, or -1 and -2 to increase or decrease image brightness. These adjustments did nothing to improve the overall HDR balance and we ended up being most satisfied with the 0 default setting. But they may be helpful in adjusting the picture to your particular screen size and screen gain. As noted elsewhere, the quality and balance of HDR pictures on all video displays can vary based on the source due to the non-standardized HDR source material. On several, but not all HDR discs, color saturation tends to appear weak on the HT2550. So when it comes to HDR, the HT2550, like all projectors, typically benefits from a few quick tweaks to the basic contrast, brightness, and saturation controls to accommodate each individual disc. The good news is that you can get a well balanced HDR picture from each source as long as you're up for making some basic picture adjustments. 3D Performance. The fact that the HT2550 offers 3D at all puts it in an elite group as far as 4K projectors are concerned. The only other model under $2000 to offer 3D at the moment is the Epson Home Cinema 4000 at $1799, which is 4K compatible using pixel shift on 1080p 3LCD panels. Compared to the Epson 4000 the 3D picture on the HT2550 is less bright and low in contrast and color saturation. If your interest in 3D is casual and occasional, and you just want to have the 3D effect available on your projector, the HT2550 certainly provides this capability. If you are a serious 3D fan who wants a bright, vibrant 3D picture, the Epson 4000 may be the better option. As an aside, initial shipments of the HT2550 came with a malfunctioning 3D system that caused intermittent reversal of the sync. BenQ has identified and fixed this problem with a firmware upgrade. If you happen to have one of these early units with the 3D problem, contact BenQ for assistance as it needs to be sent to a BenQ service location for upgrade. Brightness Uniformity. The HT2550 measured 73% uniformity at both ends of the zoom. There is no visible hotspot or locally dimmer areas, so the shift in brightness is gradual and largely unnoticeable. It is brightest at the lower center and slowly fading toward the upper corners. 73% is not out of the ordinary for this type of projector. By comparison, the Optoma UHD50 measures 75% and the Viewsonic PX727-4K is 78%. Input Lag: The HT2550 measured 50 ms input lag. This is fine for most casual gaming, but serious or professional gamers will probably want a faster unit. Rainbow artifacts. Rainbows are very low on most DLP home theater projectors these days, including the HT2550. However some people are uniquely sensitive to this artifact, and there is no way to predict whether you may be one of them. If you are uncertain, buy from a reseller with a friendly return policy so you can test it out yourself. Fan noise. BenQ has done a very good job with fan noise on this projector. The noise is audible in full lamp mode, but not at all excessive or objectionable in our opinion. Dropping the unit into Economic mode will render the fan very quiet with just a low buzz that you can detect in a silent room. Even in High Altitude mode, which is required at 1500 meters elevation, fan noise is remarkably unobtrusive compared to a lot of projectors we've heard. And in High Altitude, dropping it into Economic mode renders it surprisingly quiet. On board Audio. The HT2550 has a single 5W speaker mounted on the side. However, the audio is louder and with a deeper bass range than some 20W speakers we've heard. If this is not the best audio we've ever gotten from a projector it is certainly close. This is particularly handy for backyard movies or other portable applications where you'd want sound on board. Warranty. The BenQ HT2550 comes standard with a 3-year warranty. The HT2550 has a fixed projection angle that throws an image such that the bottom edge of the projected image is a few inches (or about 10% of the image height) above the centerline of the lens. There is no lens shift, so take care to install the projector as precisely as possible relative to the screen. This projector has a 1.2x zoom lens that will throw a 120" 16:9 image from a distance of about 12'9" to 15'3". If you have your seats about 1.25x the screen width (a comfortable viewing distance for many people), they would be positioned about 11 feet from the screen. So the projector would be positioned just behind the seating area. To check the throw distance required for your desired screen size, see the BenQ HT2550 Projection Calculator. As an aside, we generally caution against aggressive use of keystone adjustments on any projector due to the fact that it operates by deactivating a portion of the display. Doing this reduces lumen output and pixel resolution. So keep keystone adjustments to the minimum possible. Color Balance. On our test sample the preset color modes are not well calibrated for optimum color accuracy. Both SDR and HDR pictures are skewed toward cool blue, and flesh tones are not as warm and attractive as they should be. Professional calibration is advised to get color balance dialed in. Once calibrated, color balance is substantially improved. Focus. Our test sample did not allow a perfect focus across the entire screen. When in sharp focus on the upper right there is a soft focus in the lower left. When optimally focused in the center of the screen, the softness on the edges and corners is not generally noticeable when viewing video. Manufacturing tolerances are evidently quite tight with this light engine design, and we would not be surprised if focus issues may be found to vary from unit to unit. Dark frame around image. This projector creates a very dark but not perfectly black frame around the projected image. The frame is about 4.5% of the picture width. So for a 120" diagonal image (105" in width), the projected dark frame is almost 5" wide around the entire active area of the 16:9 image. If you are projecting onto a screen with a black 3" wide frame, a bit of the projected dark frame will fall onto the wall around the screen. If the wall is white and you are in a dark viewing room this may be visible. So far, this is an artifact we notice on all of the projectors that have the 0.47" UHD DLP chip, so it is not unique to the HT2550. 3D Manual Settings. The BenQ HT2550 has 3D for 1080p sources only (not 4K). The projector will not automatically recognize a 3D source signal. You must go into the menu and turn 3D on in order for it to play properly. Once 3D is turned on, any subsequent 4K material being displayed will be projected in native 1080p until you go back into the menu to turn 3D off. 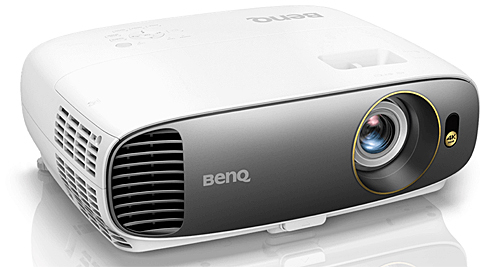 The BenQ HT2550 is an exciting projector simply because it is 4K resolution at $1499. So far it is the only model using UHD DLP chips under $2000 to include 3D for 1080p source material. This combination of factors will cause it to be selected over the competing models by many users who have an investment in 3D discs and who want their new projector to continue to be able to display them. The most obvious alternative for 3D fans is the Epson 4000, which has brighter and higher contrast 3D capability. However it is a much larger and heavier projector with no audio on board, and its 4K image is slightly less precise than that of the HT2550 due to its use of pixel-shifting on 1080p panels. These and many other performance trade-offs need to be considered carefully. For those who have no interest in 3D, the value of the HT2550 is a question of trade-offs against the other 4K projectors selling at or near the same price points. And the competition is fierce; Viewsonic and Optoma have significantly stepped up their games with impressive products that show more accurate color out of the box, higher contrast, sharp focus from edge to edge, and unique features of their own -- and in the case of the Viewsonic PX727-4K, a lower price. The 4K projector phenomenon is turning out to be quite a fascinating slugfest. BenQ is well known and highly respected for solid performing 1080p home theater projectors, especially those under $1000. 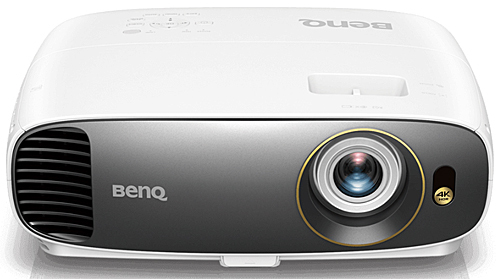 With the sudden rush of inexpensive 4K projectors, BenQ is facing some inspired and determined competitors that are intent upon taking their own fair share of the home theater market. Thank you Evan for this review and all reviews this month - it will make the final purchase that much easier! Are you able to do a long term review of these units or is that not worth it for projectors? After calibration, etc. We know these are great for home theater use because of the size - but some TVs are getting that much cheaper. 70 inches and above; but nowhere near Projector sizes. Referring to the "slug fest" in 4k projectors under $2k. It would be very useful to understand how they fare against each other in a roundup comparison review! Please consider doing that! Thank you for the thorough and objective review, Evan! I have had this projector for over 2 months and am lucky enough have just received a v1.03 unit which fixes the 3d Synch issue you mentioned. I am very impressed by the 3D performance, color accuracy, and overall picture quality of this projector. There are some settings that need to be dialed in coming out of the box, but the new 1.03 units seem to have better out of the box settings to my untrained eye. For what its worth here are my settings that I have confirmed produce the same image on multiple units... I love this PJ!!! At this point in time I'm really not impressed at what you get for nearly 2 grand. I'm strongly leaning towards a laser DLP when I see how far things have come in bulb projectors in the last 10 years since I bought my 720p optoma. Does this have frame interpolation? Frank, no, there is no FI on this model. Can somebody explains how the 2.4:1 aspect ratio preset works? Does it crop the 1.85:1 image to be presented as a 2.40:1 Panavision format?, does it stretch or distort the image in any way?. Do you see the black bars on the top and the bottom for the panavision films, or does it crop it out to present only the 2.40:1 frame as if playing a movie with QuickTime?